The boy said, Lads, don't waste my time, can ye no dae some Jim Reeves? 'I Wouldn't Change A Thing' is not only a very personal account of Iain's forty-year career. It also says a lot about the man whose most conspicuous character trait is his inconspicuousness. A rave review in a German newspaper started with the words: 'When he came in you could have taken him for the janitor ...' Simplicity, authenticity and a capacity for self-mockery have made him a favourite with his audiences. In November 1999 he announced - inconspicuously - that he was going to retire from touring. Even though he started learning to play the highland pipes at the age of seven, and played in a prize-winning pipe band for years, a musical career was not on the cards from the start. The war, which hit his native Glasgow hard, and his mother's death when he was twelve were formative experiences of his childhood. From 1944, his formidable grandmother brought him and his three sisters up. The boy learned a proper trade - watchmaker and goldsmith - and went to work in his father's firm. He prefers not to remember his military service; however, it was here that he was taught his first riffs on the guitar. In the late Fifties he went to a Pete Seeger concert in Glasgow. The down-to-earth, American banjo player who would even cut wood on stage if it served his music made such a tremendous impression on Iain that he went and bought a banjo. He had found his instrument. 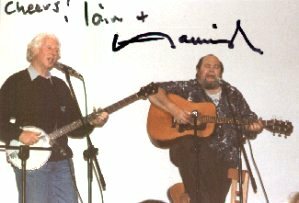 He joined the emerging Scottish folk scene and discovered there were models to be found nearer home: Alex Campbell who introduced Europe to British folk music, Josh MacRae who got the first folk song into the charts with 'Messing About on the River', and that writer of both humorous and overtly political songs, Matt McGinn. Unlike fellow musicians like Hamish Imlach or Archie Fisher and his sisters Cilla and Ray, who were born into the British folk revival and started playing more or less professionally while still in their teens, Iain was in his late twenties when he formed his first band. In 1960 'The Islanders' emerged. They were, or so Iain says, 'not very good, but successful'. These things happen. If you know, however, that he is his own severest critic, this harsh judgment may be taken with a grain of salt. After long 'apprenticeship', in 1970 Iain decided to leave the background and earn his money as a solo artist. Economic change in Scotland may have contributed to the decision to close down the parental business which Iain had been running with his wife Sadie from 1960. However, it was probably the growing demand on his time by his second job that made a decision between the two necessary. For his wife and his two daughters life with a constantly absent father can't have been exactly easy. From 1973, he was increasingly touring Germany and other European countries, and also the United States - often nine months out of twelve. Sadie kept the home running. She doesn't speak about what this meant for her. Daughters Isla and Fiona do admit to occasionally being embarrassed by having to give their father's job as 'folksinger' in school. Isla preferred to state he was a plumber instead, while Fiona, if she knew her father was appearing on TV, e.g. in the series 'A Better Class of Folk' hosted by Dominic Behan, would steer her schoolfellows to a café that didn't have a set. As a solo artist, Iain has always been political, though he is no agitator. The songs he likes best are the ones with a subtle political message. This may account for his passion for story songs. He doesn't care where he picks them up - whether at home in Glasgow, from Adam McNaughtan who not only wrote the hilarious 'Oor Hamlet' but also 'Blood Upon the Grass', on the murder of Victor Jara, or in the States from where he has brought back and 'scottified' many of his best-known songs. He has a particular liking for Harry Chapin, the late American singer-songwriter and co-founder of World Hunger. Whenever Iain sang a particularly impressive or moving new song you could almost be sure that the author was Harry Chapin. After Harry's premature death, his wife had a tape of songs he left behind sent to Iain MacKintosh. She didn't know Iain but she had heard that he was keeping Harry's name and songs alive. Iain's professional work with the sadly missed Hamish Imlach turned into a lifelong friendship, although - or perhaps because - this was a meeting of absolute opposites: On the one hand the spare, quiet, self-contained aesthete, careful with money, abhorring cigarettes and hardly ever seen drinking; on the other hand the large, generous bohémien who would freely admit his addiction to good food, alcohol, nicotine and other people's company. As in life, this contrast had its effect on stage when Iain and Hamish started performing as a duo. Unlike Hamish, Iain has never been a focal point for the folk scene. He is too private for that, and is too little interested in some of the accompanying features of the scene. Also, he soon discovered songs that could be called folk songs only by virtue of his presentation. 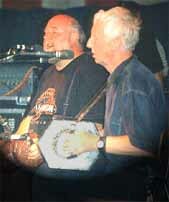 In spite of all this he enjoys the friendship of many fellow musicians, whether they be stars like Allan Taylor, Alan Reid, Brian McNeill or the Sands Family, or people like Arthur Johnstone who, as the long-standing 'engine room' of Glasgow's Star Folk Club, helped to keep the music alive at grassroots level. Incidentally, the Star Club voted Iain 'folksinger of the year' several times in his career. For some fellow musicians, Iain has become a kind of father figure by virtue of his age and experience. 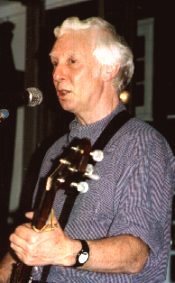 Who would have guessed that among the musical influences on 'Wolfstone' must be counted 'Uncle Iain', who many a night played the sons of his good friend Peter Eaglesham to sleep with his banjo and thus helped foster their interest in the music. However, Iain also tells the story against himself of how, many years ago, he tried in vain to convince a fifteen-year-old who had run away from school in order to join his brother's band, of the advantages of getting an education. Runaway Phil Cunningham went on to become Scotland's accordion wizard (and one of Iain's musical heroes) and probably never once missed his unfinished education. However, in folk music, as everywhere, you don't become a star simply by being a virtuoso player. You also need luck, a sense of showmanship off as well as on stage, and perhaps more readiness to adapt to audiences' expectations than Iain was willing to bring to his job. That's why he never got his big break, unlike, for instance, long-haired stand-up comic Billy Connolly who started out as a folksinger with 'The Humblebums' at roughly the same time as Iain. There is no indication, however, that Iain envies him his material success and his world-wide popularity. Iain has got his own highlights: He feels at home with what he is singing and doing because he knows he is doing it well and it fits his character. Although rather self-contained, he is loved by many people. He seems to have had virtually no bad reviews. One reviewer once wrote of 'the Rev. Iain MacKintosh', an allusion to his almost priest-like demeanour on stage, and then went on to speak of 'the Revered Iain MacKintosh'. Maybe there was a grain of irony hidden away in this, for on the other hand - on stage and even more so off it - Iain is known as one of the best tellers of bawdy stories on the scene. Many of his fans will remember their sense of shock when they first heard this serious, quiet man who seemed like every mother-in-law's dream render 'Let's Do It', the 'Mermaid Song' or any one of his many bawdy songs with that charmingly impudent grin of his. One frequent topic among MacKintosh fans concerns the question: What makes him the stage presence he is? The man is no banjo (or concertina, or bagpipe) virtuoso - as he would be the first to admit. His voice is agreeable, but not great. He is no eccentric in either apparel or demeanour. During his concerts nothing happens. He just stands there on stage, moves his fingers to play the banjo, moves his mouth to sing, and uses facial expressions - sparingly - to project moods. And yet, there is such a lot going on between him and his audience. I remember a conference of young 'greens' where Iain MacKintosh was engaged to open for a rock band. Two hundred ecologically-minded teens and twens were watching silently as a white-haired man in his late fifties, clad in jeans and a blue pullover, climbed the steps to the stage, banjo in hand. Applause was sparse, but when the second song provided some semblance of an 'Irish' rhythm, some felt bold enough to clap along. Before the next song, the man on stage, who must have seemed fairly elderly to his young audience, looked around him and explained gently, but with a wink, 'Listen, it's o.k. to clap along. Just remember it doesn't fit every song!' There was no more clapping along, whether fitting or not, but at the end Iain had to do three encores and finally left the stage pointing out - typically for his attitude to fellow musicians - that it would be unfair to let the rock band wait any longer. His audience started a spontaneous collection to pay for his hotel and asked him to stay on and do another gig to round up the conference two days later. He agreed on the spot. At his gigs he avoids mickey mouse stuff and loudness; the stronger the effect if he - very rarely - does turn up the volume. Usually, however, he succeeds in getting his meaning across without raising his voice. It is songs about social problems, injustice, or human tragedies that give an inkling of the man behind the balanced stage performer - a man who is very sensitive and capable of strong reactions to the world around him, but also one who prefers to keep his thoughts and feelings to himself. Off stage, too, he is not one to argue or waste energy on, to him, fruitless debate. For the other side, this can at times be rather frustrating. In the same way, his simple, downright na�ve air is only part of the truth. The admiration he meets with still fills him with wonder, for although he has a healthy self-regard he does not see himself as someone special. On the other hand, he is sensitive to being patronised or treated unfairly, and weighs the pros and cons of starting a row about it. The usual answer is 'no', even if this means financial loss, but he doesn't forget. Having said this, there are a number of venues, mainly Scottish clubs, who can remember Iain waiving his fee and saying, 'Give me what you can afford'. In Scotland in particular, the music means more to him than personal gain. This summer Iain MacKintosh turned 68. Recent years were not without their problems. The death of Hamish Imlach in 1996 hit him hard. On the other hand, he has formed a new musical partnership with ace musician / songwriter and fellow Scot Brian McNeill which both seem to enjoy hugely. It was never meant to be permanent, however, even though they have made a CD together; a live CD will be coming out later this year. Finally, after last year's big flu epidemic, Iain was discharged from hospital with some friendly advice from his doctor to avoid smoke-filled rooms. He intends to follow this advice. From next year he plans to be at home much more often, look after his family - not least his three young 'grandweans' - and play only when he feels like it. In October he will be doing a farewell tour of Germany, the country where (next to his Scottish homeland) his art has been most widely appreciated. Many people will miss his concerts where nothing ever happens.